I'm hoping you didn't notice my absence from the blog last week. I was good and actually wrote a few posts in advance to pop up whilst I was away. It has caught me up (I think) with the backlog of things I needed to talk about and it gave you something to read while I was away on holiday. 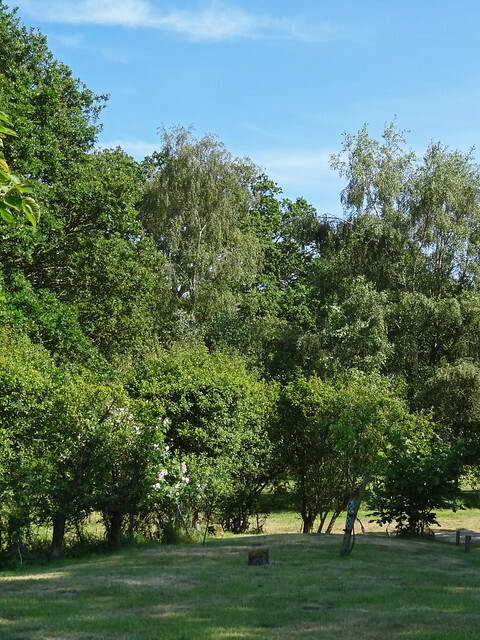 I had a lovely time on my holiday, staying in a cottage in Suffolk, a place I've never visited before. It's a gorgeous place and we will definitely be going back. I won't fill this post with photos of my holiday, but if you are curious enough about what it looked like, here is a link to my holiday photo album on Flickr. One of the things about not being in perfect health is that there is lots of sitting around recovering from days out, whilst on holiday. We chose the cottage for it's views as well as it's location. My OH (other half) could go for nice long walks just from stepping outside the door of the cottage, whilst I could lie on the sofa knitting and enjoying the view. It worked out brilliantly in that respect. Of course I had to have crafting to divert me whilst laying around, so I chose my projects carefully. I decided to cast on Mayura by CrystalRose. Not many people have made this shawl yet but the colour of the sample copy reminded me so much of some Wollmeise Pure that I had bought, that I really wanted to use that yarn with this pattern. Let's face it, knitting with Wollmeise yarn on holiday has to be a nice knitting treat. Aren't those colours wonderful? The orange one is Sanguinella and the turquoise one is Turkis. I was originally going to create my own pattern using these skeins of yarn but Mayura appeared in my suggested patterns feed on Ravelry and it seemed perfect. The pattern is written so that there are sections of very straight forward knitting interspersed with "thinking about it a bit" knitting. It's perfect for a holiday knit. I could cruise along with the easy bits whilst reading or chatting and then do the trickier bits when I needed a little bit of mental exercise. Plus it was in garter stitch. I love Wollmeise yarn in garter stitch, it drapes so beautifully. The shawl is divided into sections that have increases and decreases to create zig zags. 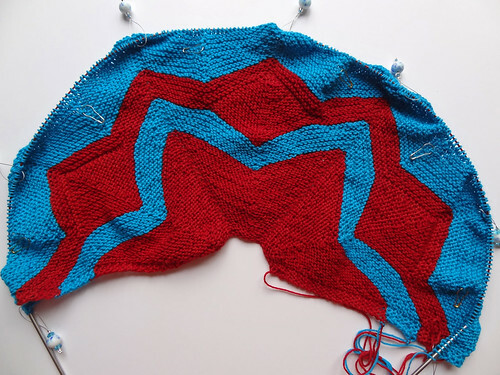 This alone would make it a striking shawl, but then there are the added fun bits, the mitred squares. These are very cleverly done, but I decided to make a slight tweak to the pattern. 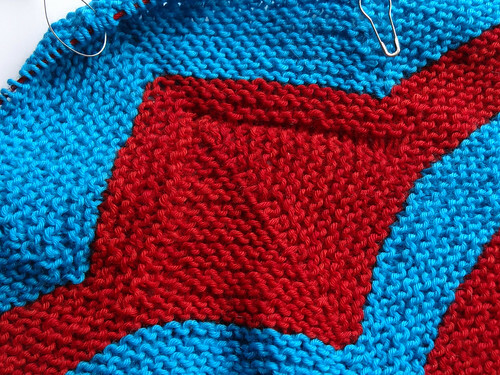 In the pattern the edges of the mitered squares are picked up so the picked up stitches show on the RS and the WS of the knitting. I decided I wanted a balanced appearance and decided to pick up the stitches from the back of the work when I was on the WS. This means both the picked up chains of stitches are hidden on the back of the work. 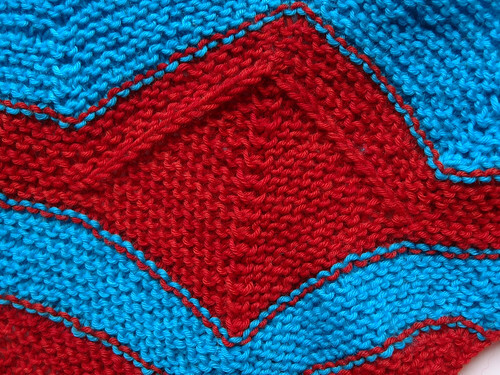 I prefer having a uniform appearance for my mitred squares! I did make one mistake with this shawl. I got my MC (main colour) and my CC (contrast colour) mixed up. I ended up having to rip back several inches of work, which annoyed me because it was a silly mistake to make. However, I've got back now to where I was, before the mistake was discovered. Of course the other project I took with me was socks. I wanted something small and portable for the long car journey to Suffolk and back, plus it would be good handbag knitting for when I was sat somewhere and my OH went off exploring. I wanted to make vanilla socks but with nice yarn. I decided to cast on some special yarn I got recently. Stockinette Zombies had a discount code for Desert Vista Dyeworks, a dyer I wanted to try after hearing so much about her yarn. The discount code meant the yarn would drop down under the customs charge threshold and make it affordable for me. Of course I bought a skein! The yarn is Viso, 75% merino and 25% nylon, 4 ply weight, but with a good yardage of 462yds/422m. The colourway is Peter Max. 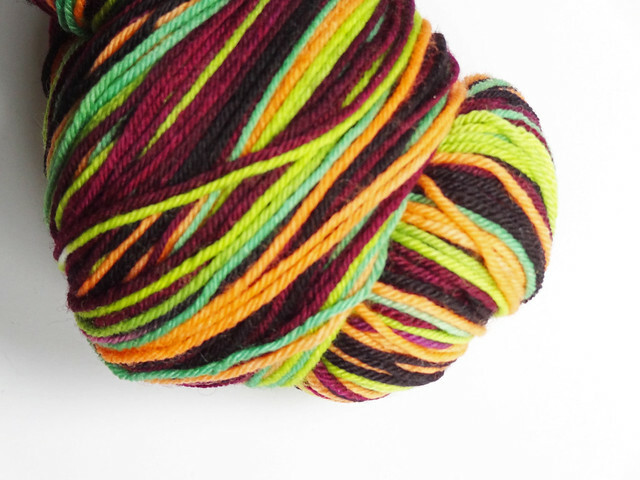 I didn't know when I bought the yarn that Peter Max is an artist who is known for his psychedelic colour palette. Now I know! I just bought it because I like the colours. I managed to get one and half socks done whilst I was away. Vanilla socks really are the best car knitting, because I don't have to look very often at my hands, which means I don't get car sick. The yarn is very light and bouncy. It doesn't feel very strong and I am a bit worried about wear. However I don't go out very often so my socks are generally worn as slippers most of the time anyway. 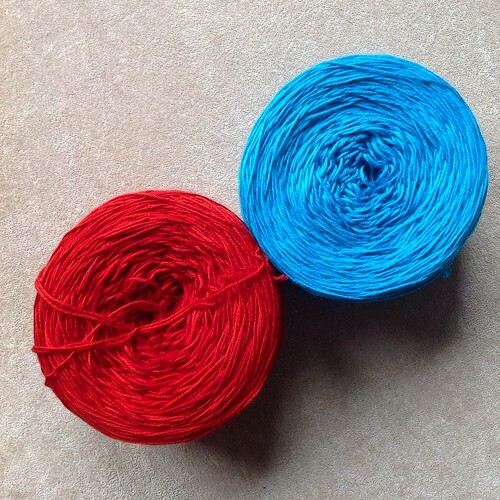 It is lovely yarn to knit with and the colours are fantastic. I've enjoyed working on the socks and now I only have the cuff on the last sock left to do. 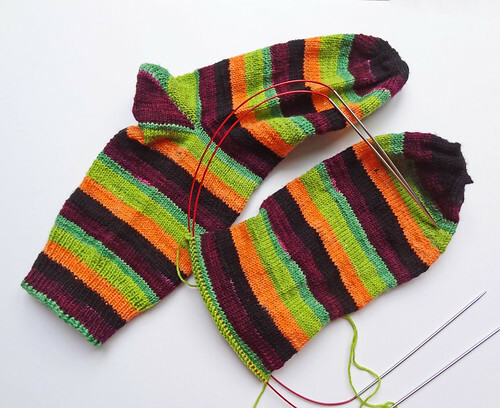 I used the opposite end of the yarn for the heels as I do all the time now, for striped socks. I really like how it maintains the stripe sequence on the main part of the sock. With the Fish Lips Kiss Heel, which is my favourite heel to do now, I knit the first stitch of the heel in the main yarn and then switch over to the yarn from the opposite end of the skein and use that for the heel. Then I drop that yarn and pick up the main yarn again on the last two rows of the heel where the last two twinned stitches are picked up at either side of the heel. This technique seems to minimise holes. I really want to finish these socks so I can wear them, they are so squishy! On holiday I also took some spinning, but I shared a picture of that recently. I'll talk about that more next week when I've got it finished. I was pleased with what I accomplished on holiday, but I'm also pleased that the knitting and spinning I took worked out well for enjoyment and the level of difficulty. It's not often I get my holiday knitting right!